This White Paper focuses on three hot topics in the TMT space currently: Big Data and the ‘Internet of Things’, both examined through the prism of machine-to-machine communications. We have grouped these concepts together, since Big Data analytics within M2M really only exists within the context of heterogeneous information sources which can be combined for analysis. And, in many ways, the Internet of Things can be defined in those exact same terms: as a network of heterogeneous devices. The white paper does a good job of exploring the emerging trends of the Internet of Things, potential business opportunities and challenges faced. 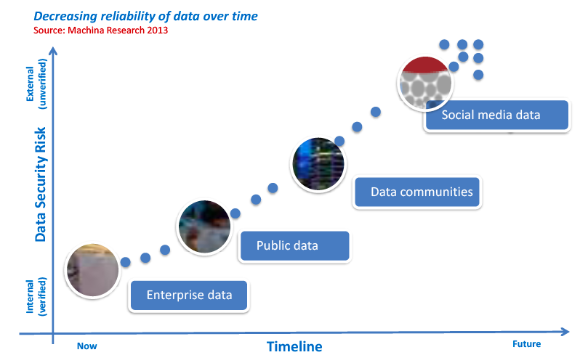 Big Data is about “mashing up” data from multiple sources, and delivering significant insights from the data. It is the combination of data from within the enterprise, from openly available data (for example, data made available by government agencies), from data communities, and from social media. And with every different source of data arises the issues of authenticity and security. Machina Research predicts that as a result of the need for data verification, enterprises will have a greater inclination to process internal and open (government) data prior to mashing-up with social media. The following diagram shows the increase security risk as more data from external sources is collected and analyzed. This yet another indicator of how Identity and Access Management will be critical in the successful evolution of the Internet of Things. So Much Information; So Little Time. After thinking about that conundrum some more, I drew a graph like the one on the right on my whiteboard. As the available information in the world continues to expand geometrically, we are constrained by an absolutely finite resource – time. To my knowledge, nobody’s days have grown longer recently. 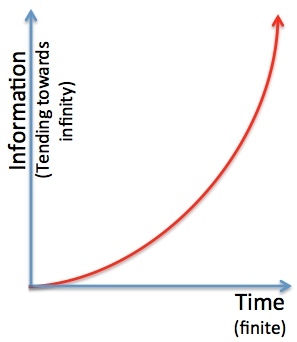 Yet the amount of information we have at our disposal continues to tend towards infinity. Big data analytics certainly attempts to deal with this challenge. Ever more sophisticated tools sift through larger and larger piles of data, attempting to discover “Subtle Patterns and Relationships” that may have importance in our lives. It as if we are attempting to grasp and understand the infinite from a finite frame of reference. Spirituality, our true aim, is the consciousness of victory over self and of communion with the Infinite. I doubt that the Infinite of which he spoke will be found in the near infinite pile of data in Facebook or Twitter, but it is food for thought. “Likes” for Austin, Texas; “Big Momma” movies; and the statement “Relationships Should Be Between Two People Not the Whole Universe” were among a set of 10 choices that, combined, predicted drug use. “Likes” for swimming, chocolate-chip cookie-dough ice cream and “Sliding On Floors with Your Socks On” were part of a pattern predicting that a person didn’t use drugs. What in the world do all those things have to do with each other? … arises from an emerging discipline in which experts sift through extremely large digital data sets, such as collections of web searches or Twitter messages, for subtle patterns and relationships. “Subtle Patterns and Relationships” is the key phrase. In our highly connected world, we all leave digital breadcrumbs scattered about that are subject to this type of analysis. Sophisticated data analytics will progressively be able to pinpoint behavior patterns and even predict behavior, based on relationships between seemingly disparate and unrelated bits of data. Will this be used to do a better job of targeting advertising? If so, that might be beneficial to vendors and consumers alike. But could it be used for nefarious purposes – even harassment, stalking, exploitation or discrimination? You bet. We had best be careful out there. Nishant Kaushik’s tweet today prompted some paranoid thoughts about the use of big data analytics. LexisNexis … is the largest data-broker in the world. They create vast profiles on people and use that information to create various reports that they sell to companies of all kinds. These reports are used to make decisions about renting, insurance and more. In the past these reports have been purchased by law enforcement and criminal organizations; all to find out more information about you. Are there legitimate uses for all this data? Yes. But is there potential for illicit exploitation and mis-use of that data? I’d bet my bottom dollar on it. The unintended consequences of amassing all this personal data are what worry me. 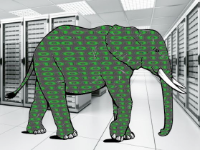 Who is Securing Big Data?